It is probably safe to assume that most consumers like to work with folks they know can be trusted. In Real Estate, like some other businesses there are those that can always be counted on for delivering great advice and others that only care about their own pocket book. I always tell people some of the best Real Estate agents are those that don’t NEED to make a sale! It makes perfect sense because an agent that NEEDS business is far more likely to tell a buyer or seller something they want to hear rather than the truth. Short sales unfortunately are a specialized Real Estate transaction where information is often times bandied about with no basis of fact. Many Realtors blindly go around telling people in financial distress that a short sale is better for their financial future because their credit score will not be impacted like going through a foreclosure. Folks this could not be further from the truth! While there are certainly advantages of pursuing a short sale vs foreclosure, credit scoring is NOT one of them. There will be plenty of Realtors that will read this and argue with me telling me I am wrong. As a Realtor who is tech savvy and social media connected you will see many of my articles in places such as Linkedin, Twitter and other Real Estate forums. They will see some of my short sale articles and flat out tell me that I have incorrect information. When I mention the credit scoring impact of a short sale compared to a foreclosure is just about the same they scowl in disbelief. They will tell me I don’t know what I am talking about because they just learned differently at some short sale course their local Real Estate board was putting on. At this point I will be laughing because the people that teach these courses are usually Realtors that couldn’t make it in the business. They teach this nonsense because it is propaganda that helps get Realtors more business. By now you are probably thinking how do I know the credit scoring impact is similar in these two financially stressful events. You have every right to be wondering! I know because I go right to the source. My FICO is the governing body for credit scoring including what happens in both a short sale and foreclosure. Since I am often getting challenged on the credit scoring impacts by other Realtors and get asked all the time by my clients, I am going to share a very interesting study that was conducted by Fair Issac corporation. The FICO study took various types of mortgage delinquencies on three credit bureau profiles of consumers that had scores of 680, 720 and 780, respectively. The study focused on consumers whose credit characteristics (e.g., utilization, delinquency history, age of file) were typical of the three score points considered. All of the consumers had an active currently-paid-as-agreed mortgage on file. Results of this credit scoring study are shown below. 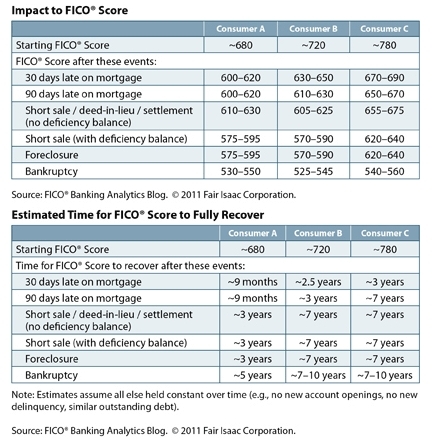 The first chart shows the impact on the credit score for each stage of delinquency and the second shows how long it takes the score to fully “recover” after the fact including a short sale or foreclosure. What you can easily see by this study is that there is a negligible difference in credit scoring when comparing a foreclosure or short sale. While it seems unfair, those that had a higher credit score to start will see a greater scoring drop. In addition, the higher starting score, the longer it takes for the score to fully recover. While there is a minimal difference in scoring impact between moderate and severe delinquencies, there may be a significant difference in time required for the score to recover completely. These statistics are right from the guys that make credit scoring. They are not opinions. This is actual data that was put together and sourced by FICO themselves. So what are the benefits of going through a short sale rather than letting a lender foreclose on your property? The biggest advantage is that you will be able to buy another home in the future a lot quicker than you would with a foreclosure. Generally speaking the turnaround time for getting another loan after completing a short sale is two to three years. In a foreclosure it is typically five to seven years. There are a number of circumstances that can affect the time frame including whether the loan is FHA, Fannie Mae or Freddie Mac. For a complete financing guide see buying a home after short sale or foreclosure. One of the other big factors you need to consider is your employment status. There are a number of large companies that will not hire a new employee that has a foreclosure on their resume. While this may not seem fair with all the financial turmoil that has taken place over the last five years, employers look at a foreclosure as a black mark on your record. In other words when you short sale a property you are owing up to a financial commitment. In a foreclosure you are walking away and taking no responsibility for your debt. The last reason why more and more will choose a short sale over a foreclosure is just the sheer embarrassment of going through a foreclosure proceeding. In some states an auction is held right on the front lawn of the property. Who wants to lose their home and then have salt rubbed in the wound by watching a bunch of buyers compete over it. This is an unsettling experience for most. The goal of almost anyone that goes through a short sale or foreclosure will be to improve their financial stability moving forward. Of course improving the impact a short sale or foreclosure had on their credit scores will typically be one of the first areas that people look at once they are back on their feet. There are certain things you can do to help fix your finances after a short sale or foreclosure that are covered in this helpful article. Unfortunately, sometimes people just don’t realize they have options and just lose their home to foreclosure. Many have never taken the time to do any research and just assume there are no alternatives. A short sale can be a great alternative for some home owners – best of luck if you are one of them! If you are need to short sale your home or condo in Ashland, Bellingham, Framingham, Franklin, Grafton, Holden, Holliston, Hopedale, Hopkinton, Medway, Mendon, Millbury, Milford, Southboro, Westboro, Natick, Northboro, Northbridge, Whitinsville, Upton, Uxbridge, Shrewsbury, Sutton, or Worcester get in touch! I would love to interview for the chance to represent your short sale transaction. I am successfully completing short sales through out the Metrowest Massachusetts and Worcester County areas. So far, knock on wood, I have a 100% success rate for short sale approval! Short sales are difficult transactions that are critical to have the right Realtor representing you. 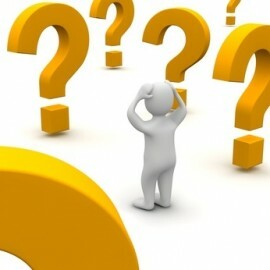 Do not make the mistake of picking a Real Estate agent that does not have experience closing short sale transactions. If you are outside of the Metrowest/Worcester Massachusetts area and need to do a short sale please feel free to contact me and I would be happy to refer you to a Realtor in your location that handles short sales and knows what they are doing! I have referred short sales to other Realtors all around the country. About the author: The above Real Estate information on Credit scoring impacts of short sale vs foreclosure was provided by Bill Gassett, a Nationally recognized leader in his field. Bill can be reached via email at billgassett@remaxexec.com or by phone at 508-435-5356. Bill has helped people move in and out of many Metrowest towns for the last 25+ Years. Excellent article Bill Thanks for the clarification & Info!! Good points, and the same holds true for those in the auto side as well who think that a voluntary repossession is very beneficial over involuntary. In reality, there is very little difference. Great info you have here that will definitely help not only Metrowest MA areas, but those who are in the same boat. I like the chart you shared. It puts things into perspective. I know it’s damaging but I didn’t know it’s more damaging to people with spectacular credit before terrible things happen. Loreena it really isn’t fair when you thing about it that someone with stellar credit takes a bigger hit than someone with a lower credit score. Of course there are a lot of things centered around the banking industry that don’t make a lot of sense! Although I don’t deal much with either foreclosures or short sales, I was under the false impression that short sales were better for your credit standing. Thanks for setting me straight and writing an authoritative post. I’m going to link here from my blog. Wow, this was eye opening. I guess the good news is that the short seller will be able to re-buy if they have the fortitude in two to three years. Thanks for the great article. I will pass this on. Very interesting. What particularly caught my eye is you mention that short selling is the preferred choice if you’re looking to purchase a home again in the somewhat near future, whereas by going through a foreclosure, that can be off the books for much longer. Glenn the shortened wait time in being able to buy a home again in the future is really one of the biggest advantages of doing a short sale. Bill, great article, and I too have seen the FICO study. Great points as usual! Excellent! The best information I’ve ever read about the differences between short sales and foreclosures on your credit scoring. Thank you so much! I took the SFR course and was taught that there was a 100 point difference. I am so happy to have the right information to tell my clients. Bill, I greatly appreciate the time you took to put those authoritative charts up showing the before and after scenarios. I too had been told the credit score hit was much less in most cases with a short sale vs a foreclosure. Your discussion clearly shows we should not be putting as much weight into that element. Thanks! Thanks John there is a of false information that is spread regarding credit scoring impacts of a short sale vs foreclosure. This is excellent information about the short sale process. The 2-3 year timeline before being able to buy again is on track as well. Great information and I think you did a fine job of explaining it very throughly. Many people are giving up and not realizing the long term impacts of going to a short sale or foreclosure. Thanks Anita & Charles. I appreciate the compliments on my thoughts about credit scoring impacts in a short sale vs foreclosure. Seems to me they should redo the credit scoring process. It takes you a lifetime to build a 780+ credit score (I’m 33yrs old) but you miss one payment on a mortgage and can get dinged 90+ points? This could be your only default one time and pay a steep price for it. Good chart Bill! Jay I agree with you completely. I think the credit scoring system is completely messed up when it comes to missing payments on a loan. I agree with Jay, a credit score above 750 takes years and years unless you throw yourself in a lot of debt and figure out how to pay it off super quick. At the same time you can’t blame the government for getting more involved with the banking laws because we the people have screwed ourselves by going into deep debt and not paying it back. There is nothing substantively correct about that view. If you short sell and don’t pay the deficiency you are no more owning up to your financial responsibility than if you let it foreclose and aren’t subject to a deficiency judgment. The only moral difference between deed in lieu, foreclosure and short sale is that with the first you give the bank back to the house pre foreclosure when you never agreed to do that in them mortgage or deed of trust. In the second you keep the house until the bank takes its collateral back by the legal process it agreed to in the trust deed or mortgage. In the last you help the bank sell the home instead of them having to sell it as REO themselves which is something that you never obligated yourself to do in the mortgage or trust deed. Everything from your interest rate to the cost of the loan was derived from what you obligated yourself to in the mortgage or trust deed and the banks calculations about the cost of recovering collateral according to the mortgage or trust deed. You don’t get favors when your calculations are wrong and you don’t owe the bank favors if theirs are wrong. If they are having a hard time foreclosing because of their mers and securitization issues etc. and the fact that they did millions of loans and now have to default service them and can’t get the foreclosures done then you have every moral right to sit in the house and collect free rent until it forecloses and you deserve any lost equity that you can recover. You were the “other investor” in the loan and the financial institutions fraudulently ruined the market you were investing in and unfortunately there are no laws to protect you as an investor in your home. Enjoy any possible way you can benefit from the possession of your home. Getting back at the big banks is a little like getting a mob boss on tax evasion when you can’t get them for murder. I am currently buying a short sale, renting it from the owner for $500/month during closing and taking as long as possible to close to prolong my period of cheap rent for myself and a little income to the seller. Michael I totally do not agree with your perspective. In a short sale most of the time the owner stays in the home, keeps it up and maintains it. There are thousand of home owners that let their homes go to foreclosure and just abandon them. There are also some that are foolish enough to strip them of anything of value including appliances, heating systems and even the copper piping. Beyond this one aspect someone who does a short sale negotiates with the lender and doesn’t just abandon the home. If a home owner negotiates paying the lender 20 cents on the dollar would you not agree that is better than paying them nothing? In my book that does show some financial responsibility! A lot of people that are forced to short sale a home do so with much embarrassment. Many of them have never missed paying someone back in their life. Someone who “walks away” and moves in the middle of the night, only to never return does not have the same moral character. I respect your point of view and the above was a bit of a rant. But, I think where we may be diverging is in the concept of paying what one “owes” the bank. I feel bad for both investors involved in a residential loan. The investor in the loan and the investor in the home. Both were defrauded by a combination of entities and individuals in the financial sector. What the banks attorneys argue regularly in court is that when you get into a house nobody promises you that it will appreciate and if your investment goes south you need to take responsibility. If we were in a normal situation this would be true. We are not in a normal situation. There are many, many people out there who got into a loan that they could afford, and later had a job loss, heart attack, or for whatever reason came to a point where they needed to sell their house, but lo and behold their house had gone down 30% in value and couldn’t be sold. The banks want to tell the story that the housing market just kind of collapsed as some kind of fluke of nature and we are all in this together and they are trying their best to help people who are somehow in a bad situation through no fault of anyone’s. That is the farthest thing from the truth. Yes, there were and always will be ton’s of irresponsible buyers. They were the “fuel”. The banks lending practices and underwriting exceptions were the forest fire. The creation of MERS and securitization of loans and ability to lie to investors and HUD about the quality of the loan was the spark. Banks ability to sell the loans off and not maintain the risk in their portfolio was the spark. You can blame the forest fire on the fuel I guess but that is certainly only part of the story and not a very significant part. So back to the responsible borrowers and homeowners who may have been in their homes making on-time payments for years before their home value plummeted. They are very literally victims of bank fraud just like the investors who funded the loans. Does a victim of fraud owe the perp an obligation to try to make sure the defrauder gets everything. No, the victim just takes a look at the situation and since he has no real recourse against his defrauder he does everything possible whether by technical defenses to foreclosure or by seeking modifications as a way to delay foreclosure, etc. to derive as much as he can for himself and his family out of situation in which he has been financially raped by the servicers, rating agencies, appraisers, etc. I don’t really blame the low level loan originators, and underwriting staff. They are given tasks and directions and incentives and they do what they are encouraged and rewarded for doing. What happened is the servicers, rating agencies, and appraisers (under great pressure from the servicers) ruined the market so that all homes in the market depreciated regardless of whether the owner was responsible or irresponsible. They did this by flooding the market with bad loans and lying to HUD and investors about their quality. They felt safe to do this because they could pass the risk on. If the market were a swimming pool these lenders (like new century mortgage that originated a million loans in 2006 and then went bankrupt) dumped a ton of sewage (bad loans) into the pool and it made everything in the pool go down in value. If you are an investor in this pool you do not owe your lender anything. You owe it to yourself to try to get out of the pool with anything you can retrieve of value. I do believe that short sales are a great option for a lot of people for a number of reasons and I advise many people to pursue short sales for those reasons, but they are practical reasons, not moral ones. By the way I think your blog is excellent. The best I have seen on many issues. I have shared a lot of your stuff. I appreciate the research and open sharing. You are of course not obligated to let my rants through the moderator’s filter. I will not have hurt feelings in the least. Those posts are abnormally long anyway. Thank Michael I appreciate your compliments on my short sale blog posts. I have been working in the short sale arena now for the past six years. I am fortunate to work with a great team of attorney’s who actually do all the negotiating with the lenders. I do however, have quite a bit of knowledge on the subject and know how to structure the contract so it works for the seller client.